Genomic resources have recently been developed for a number of species of Fagaceae, with the purpose of identifying the genetic factors underlying the adaptation of these long-lived, biologically predominant, commercially and ecologically important species to their environment. The sequencing of genomes of the size of the oak genome (740 Mb/C) is now becoming both possible and affordable due to breakthroughs in sequencing technology. However, an understanding of the composition and structure of the oak genome is required before launching a sequencing initiative. 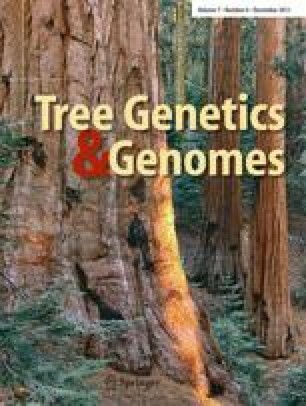 We constructed random (Rd) and hypomethylated (Hp) genomic libraries for pedunculate oak (Quercus robur) and carried out a sample sequencing of 2.33 and 2.36 Mb of shotgun DNA from the Rd and Hp libraries, respectively, to provide a first insight into the repetitive element and gene content of the oak genome. We found striking similarities between Rd sequences and previously analyzed BAC end sequences of pedunculate oak, with a similar percentage of known repeat elements (5.56%), an almost identical simple sequence repeat density (i.e., 29 SSRs per 100 kb), an identical profile of SSR motifs (in descending order of frequency—dinucleotide, pentanucleotide, trinucleotide, tetranucleotide, and hexanucleotide motifs). Conversely, the Hp fraction was, as expected, enriched in nuclear genes (2.44-fold enrichment). This enrichment was associated with a lower frequency of retrotransposons than for Rd sequences. We also identified twice as many SSR motifs in the Rd library as in the Hp library. This work provides useful information before opening a new chapter in oak genome sequencing. The online version of this article (doi: 10.1007/s11295-011-0412-4) contains supplementary material, which is available to authorized users. This project was supported by INRA and the European Union: a postdoctoral fellowship awarded to I. Lesur (FORESTTRAC project, no. FP7-244096) and a PhD fellowship awarded to J. Durand (EVOLTREE project, no. 16322).